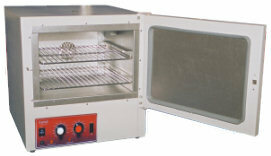 The GENLAB Dual Purpose Oven/Incubator combines the advantage of two temperature ranges in one unit through the use of a simple high/low switch. Fitted with fixed shelf runners and removable plated wire grid shelves. The top vent is fitted with a clip to hold a mercury in glass thermometer. 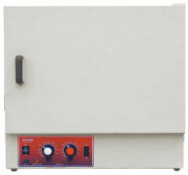 The vertical style oven/incubators are the MINIS/6, MINIS/18, MINIS/30, MINIS/40, MINIS/50 and MINIS/75. 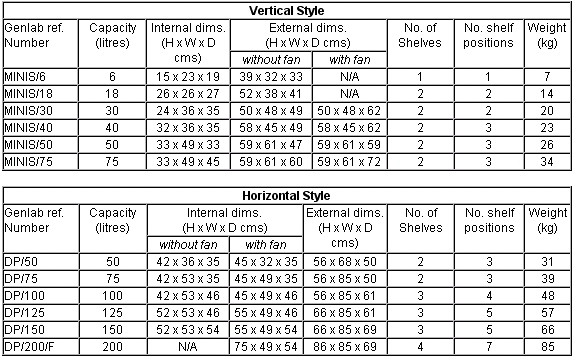 The horizontal style oven/incubators are the DP/50, DP/75, DP/100, DP/125, DP/150 and DP/200/F.